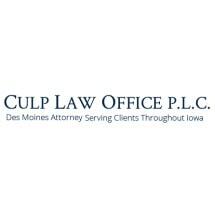 At the Des Moines, Iowa law firm of Culp, Doran & Genest, P.L.C.., we provide focused and experienced service to clients in a wide variety of practice areas. Founded in the year 2000 by attorneys Michael J. Culp, John D. Doran, with the addition of Ryan A. Genest in 2003, we strive to provide the highest level of service and quality possible the each of our clients. If you need an experienced and dedicated Des Moines litigation lawyer, contact Culp, Doran & Genest, P.L.C. today. At Culp, Doran & Genest, P.L.C., we strive to maintain the highest standards of professionalism and integrity. Our aim is to make every client feel that they are the most important one we have. Towards that end, we promptly return our phone calls and stay in close contact with all of our clients; we employ highly competent and efficient legal assistant to make sure that work is completed in a timely manner; and we address each client with respect for their own unique circumstances. We don’t have a cookie-cutter mentality towards representing our clients.